Can Kinect compete with PlayStation Move? The Nintendo Wii made waves when it came out in 2006. It wasn't because of an exciting array of incredible launch titles - there weren't any. And it absolutely wasn't due to the Wii packing dazzling HD graphics - it doesn't. It was all down to the motion-controlled gaming interface which put players inside games for the first time. Playing a tennis game suddenly became about swinging and hitting a ball, instead of using your fingers to hit the right buttons on a control pad in the right order. Gaming was revolutionised. Four years and 75 million worldwide Wii sales later, Microsoft and Sony have now both released their high-tech answers to the Wii-mote, and they couldn't be more different. While Sony's PlayStation Move uses the PlayStation Eye camera to detect and measure the location of high-tech and spatially-aware handheld controllers, Kinect has no physical controllers to speak of at all. The idea is that your body is the controller. It's up to the Kinect games and apps to use the camera and microphone to work out what you're doing and what you're saying, and to interpret your commands in the appropriate fashion. 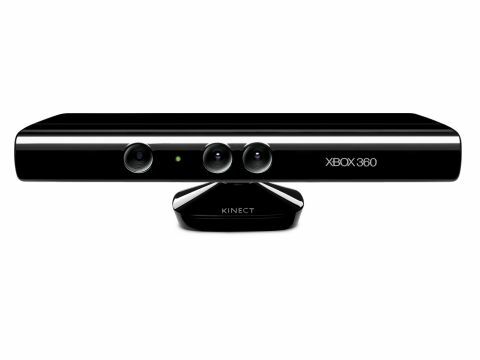 The Kinect sensor contains an RGB camera and a depth sensor to track your movement. It measures the positioning of 48 key joints in your anatomy and by tracking the movements of these joints, it can work out exactly what position your body is in. What's more, it sees in 3D by overlaying the input from the RGB camera with the depth sensor. Meanwhile the built-in multiarray microphone monitors the room for your voice - yep, Kinect even allows you to control your Xbox 360 using voice commands alone. It's almost too good to be true, isn't it? These are the hopes and dreams of every 6-year old child come-true. It's the sort of technology we only dreamed about while watching '60s TV series' like The Jetsons as kids. But this isn't fantasy. This is real. And so what we nervously want to know is - does it really work, and is it any good?